One of my junior high school shop class teachers (Yes, I took one shop class. We made a tiny turbine using copper wire and an empty thread spool), used to utter the phrase: “Dater, datter, doesn’t matter” when talking about technology. It stuck with me because it’s sounds funny and I like wordplay, but it also turns out to be pretty darn true. Data is information taken down on paper or as pixels (doesn’t matter which or how you say it! ), and it can help you out. You already know you should be keeping a tally of how many visitors you have coming to your archives, what kinds of research requests are coming in, and what the temperature of your storage room is on a daily basis. But do you know how to use that data once you have it? Here are a few examples from my own experiences, plus a few more types of data you could keep an eye on. How Many People Visit My Archives? This is a pretty easy count for me since my Archives are small, part of a larger organization not primarily focused on history, and not very well known. You also have to get to Northern New Hampshire, find a place to stay (though there's lodging on site if you want to stay right next door), cope with all of the mountain beauty around you, brake for moose, etc., etc., etc. But that’s another story! I typically receive just five to ten in-person visitors per month. And most of those are in-house folks who had a random question or needed a break! The rest are the few brave souls who have actually found me, have maybe-just-maybe done some preliminary research in our OPAC, called or emailed to confirm that a visit would be worth their while, and have the grit and determination to find me. Each of them is counted and I keep a running spreadsheet of what they were looking for, which collections they used, and their contact information. These in-person visitors are, however, just the tip of the iceberg. The vast majority of my Archive’s users contact me via phone, email or postal mail. For about a decade I have corresponded via air mail with a writer of Canadian mountaineering guide and history books who lives in Barcelona. All of these folks go on the record, too. Additionally, our email chains and correspondence become part of the Archive’s archives. Patron statistics are helpful for a couple of reasons, not the least of which is that you can tout how many people use your collections on a daily, weekly, monthly and annual basis. Anything to continue justifying your archive’s existence, right? This, combined with visitors stats from your online catalog (which you are also tracking, yes?!) can really add up even if you think you’re just a tiny, little archive. Even if only a couple of people show up in person you’d be surprised how many requests you dealt with when you look back over a month of carefully maintained data (or datter). Keeping track of what your patrons are up to can also help in locating resources for future researchers. If you tracked one patron and took down a list of the collections they looked through for their topic of interest and you get another patron seeking the same types of things a year down the road, you’ll save that much time in pulling materials that will be truly useful. You can find even more in-depth info on user metrics through the SAA-ACRL/RBMS Joint Task Force on Public Services Metrics - probably way more than you’d ever want, but hey, that’s what tasks forces are for! 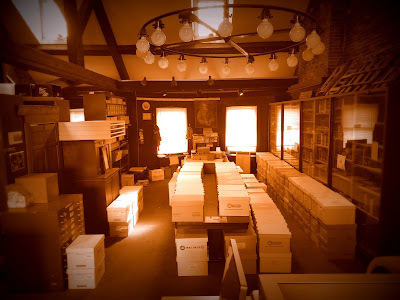 I have worked in few small archives with perfectly climate-controlled spaces for collections storage. In fact, there was no such thing when I first arrived at my current job. Everything there was in one big, open room housing the library, archives collections, my workspace, patron space and later, the desks of three other co-workers. In the early days I froze in winter until I got so cold I had to turn on the forced hot air radiators (at which point I could hear the tiny screams of photographic prints as they curled in the dry air). In summer I woozily sat at my desk wondering what it was really like to get heat stroke and imagining it felt a bit like THIS. The air conditioner in my space barely made a dent and frequently overwhelmed the lame electrical outlet into which it was plugged. When I finally did get a functioning air conditioning unit through a federal grant, I had to spend increasing amounts of time trying to explain why all that “big empty space” had to be kept cool. I would sometimes arrive to find that the unit had been shut off entirely by some energy/carbon/money-saving do-gooder who could not fathom why the unit was left on all weekend. It was still not as cool and dry as it should have been for collections storage, but that’s because we had to balance collections care with human tolerance for cold. I’ve also worked in places where collections and people lived together in the cold and ended up wearing several layers in the heat of summer when it was over ninety degrees outside. The advantage of the data showing wild swings in temp and humidity did, however, help me state my case to a funder for at least basic climate control. Later it helped secure a refrigerator from another federal grant (pretty great that you can ask the government for a kitchen appliance and call it “archives storage”, no?) where I keep film-base collections. So, you guessed it: keep a spreadsheet. Get yourself a temp and humidity monitor. I use a General Tools Wireless Thermohygrometer with remote sensors. It was over a hundred bucks but at the time it came with three remotes and it was grant funded, so … spend it like water, baby! You can get a cheaper one for about thirty dollars. Might not last as long, but it's probably fine? Every day that I am in the office the first thing I do is record the current temp and humidity as well as the max and min since the last reading. A month in and you’re ready to make all the fancy graphs and charts you want. Go a little deeper in finding the right system for you on the Northeast Document Conservation Center’s Center resource page. How long does it take you to reply to researcher emails? How much time do you spend looking up information, scanning or copying documents to answer their questions? How many hours does it take you to process one linear foot of records. Did it take the same amount of time as when you first started in the field? Does your regular work get derailed by tasks beyond your job description that you are asked to do? If you feel like you end up doing too much of any one thing start keeping track. Have a notebook out where you can jot down timestamps from your day. Sifting through and answering email: 9:00 to 10:15; scanning images and putting together a licensing agreement for a patron: 10:15 to 10:50; checking out that pile of stuff someone mentioned was in the basement and deciding what to do with it: 10:50-11:00, helping an intern or volunteer get started on a project: 1:00-1:30 (plus the intermittent questions that come later), sitting in on a meeting because someone just “thought maybe you should be there”: 3:00-4:15 (one hour meeting….suuuure). Keeping track of how long things take can help you focus on strengths and weaknesses. It can also help you make the case for delegating tasks to someone else (if there is anybody. Anybody?!?) if your plate ends up overloaded with “not my job” material. In what other ways have you tracked data? How did it help? Leave a comment below about your experiences and value (or lack thereof) of tracking.